A notification under a treaty is a Royal Prerogative act. You can listen to his comments here, starting 6 min 50 seconds in. Triggering Article 50, which is a formal communication to the European Council stating the UK's intention to leave the EU, is a notification under a treaty. Therefore it falls (rightly or wrongly) under the Royal Prerogative, which means Parliament does not need to ratify the action or be consulted about it. The government can act unilaterally to trigger Article 50. Many MPs are declaring that Parliament must be sovereign (something they have seemingly not bothered about while allowing political and legal primacy to reside with the EU and the ECJ respectively). They are right. Parliament should be sovereign. Royal Prerogative is not democratic. So how can it be right, therefore, for someone like me to say that the prerogative should be used to trigger the Article 50 notification? MPs are saying that Article 50 must not be triggered without their approval and that the prerogative should not (in their words 'does not') apply. But this is where alarm bells ring, because it seems this sudden desire for control is only emerging now the Brexit process they fought to prevent is set to begin. MPs would had have a valid point about Royal Prerogative being anti democratic, generally and in relation to Brexit, if the House of Commons had not rejected David Davis' 1999 attempt with the Parliamentary Control of the Executive Bill to curtail the use of the prerogative by transferring ministerial exercise of it to MPs for a number of scenarios - including, ironically, the signing of treaties. Voters can be forgiven for thinking that MPs want to challenge and rein in the prerogative only now because they want to undermine Brexit, or at least decide its terms. This is an attempt to change the constitutional process on the hoof for the sake of expediency, because they don't want an outcome that British voters decided by a majority of 1,269,501 to pursue. It is perfectly reasonable to ask MPs how prerogative can have been perfectly acceptable to the Commons previously when they rejected Davis' efforts to curtail it, but suddenly be wrong now just because it is the constitutional mechanism that would be used to trigger the Article 50 notification they oppose. The challenge to prerogative being used to trigger Article 50 is a naked example of political double standards. If MPs want Parliament to be sovereign they should change the constitutional process formally, in the proper manner, not try to kick it into the long grass arbitrarily because it suits their purpose in regard of this matter. They must not be allowed to subvert or frustrate a decision taken democratically by voters, because the issue was too important for Parliament to decide without formal mandate. This is why Davis is opposing something he previously pushed for. "Who does it harm more if we end up in a new tariff environment? There's nothing wrong with ambition. But at some point it becomes impossible to defy facts and reality. Liam Fox needs some education about how global trade works, or if he already knows then he needs to indulge in a bit of honesty and stop deluding himself that his vision for trade after Brexit is achievable. The UK is currently a participant in the European Single Market and enjoys preferential trade benefits from that participation, such as tariff-free movement of goods and removal of non-tariff barriers to trade. Dr Fox has made clear he wants the UK to leave the single market and trade under WTO rules. That is a perfectly acceptable view even though it would mean negative economic and commercial impacts for the UK. Countries that are not participants in the single market and who trade with it under WTO most favoured nation (MFN) status rules do not enjoy free or preferential trade with single market members. They have to impose tariffs when importing from the single market, are subject to tariffs when exporting to it, and are also subject to a variety of non-tariff barriers (NTB) to trade that are costly or time consuming or both. The tariffs are equal for every WTO MFN status country. Sure, goods can flow in either direction, but the terms are subject to hard and fast rules. The only way countries can avoid the WTO MFN rules, that require them to set tariffs on imports and have them applied on exports, be that with other countries or blocs such as the EU, is to complete a bilateral free trade agreement (FTA) with them, or become a participant in a regional trade agreement (RTA). The European single market is an RTA and Fox's wish is that we leave it in addition to leaving the political entity that is the European Union. 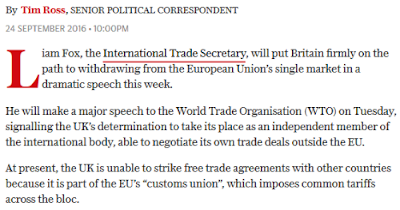 So while it may be, as Liam Fox puts it, "in everybody's interests that, as we move forward, that we have at least as free a trading environment as we have today", by being a mere WTO MFN country that is an impossible dream under global trading rules. The only way the UK can have as free a trading environment with the EU as we do today is to be a participant in the European single market. Full stop. It is an impossibility, logical or legal, that any country that is not part of the single market can have equal preferential, or better, terms for trade than the RTA's own internal members have between each other. It cannot be achieved even with a supposedly comprehensive free trade agreement such as the EU-Canada deal - and especially not under WTO MFN status. The sooner Liam Fox grasps this, and stops wasting our time with his flights of fancy, the better. Update: New Westphalian takes on Fox's speech here. Do journalists even know what the single market and customs union are? But the customs union is the European Union itself. So once outside the EU we would no longer be part of the customs union. Further, the EU doesn't belong to the single market, which his comment suggests. A country can be outside the customs union but participate in the single market. Three countries already have that position, Norway, Iceland and Liechtenstein. It would be nice if Telegraph journalists tried to understand these things before publishing such confused nonsense. So all Liam Fox will be doing is reiterating that Britain will be leaving the EU, will therefore no longer be part of the customs union and will once again, by default, speak with its own voice at the WTO. Fox will not be saying anything about continued participation in the single market, because no formal negotiation or decision about Britain's post-EU position has even taken place. If he were to say something so premature, you can be sure Theresa May will be dancing a Tarantella on his head shortly afterwards. Do the anti EEA crowd even know what British exit from it will entail? Last Friday the pages of City AM played host to an op-ed by Global Britain's Brian Monteith, in which he declares 'the Single Market is the problem – not the solution'. Having read the piece after it was linked on Facebook the question I'm left asking is, how can Monteith or the article be taken seriously? For example, nowhere in the piece is there any mention of non-trade barriers, which are potentially far more harmful to British exporters than the tariffs he focusses on. There is also no recognition of the fact there are no commercial customs facilities in place to deal with goods entering continental Europe from the UK, which will be needed if the UK exits the EEA. Also Monteith either fails to grasp or deliberately ignores the chasm of difference between participation in the single market and trading with its member countries, instead using the meaningless 'access' descriptor. This is something I have covered previously on the blog. Perhaps when Monteith starts considering the real world implications of leaving the EEA and shares some evidence of knowledge and understanding, people can assess his arguments in a balanced way. But the piece he splurged on City AM is essentially useless. Continued participation in the EEA is an invaluable first step after Brexit. From a trade and regulation perspective it keeps things as they are, giving stability and certainty to our commercial and finance sectors and maintaining inclusion in useful programmes, after we cease to be an EU member state and cease to be bound by the European Court of Justice. Continued participation in the EEA would enable the UK to negotiate a new settlement with the EU without time pressures or uncertainty. It is a fact that the UK would have to become a member of EFTA once again in order to enable continued participation in the EEA. That means paying contributions to EFTA for administration of EEA participation. Like Norway the UK would also be required to make payments to various institutions and initiatives to help fund programmes and development of east European countries. But looking at the big picture, the sums would be significantly less than our EU budget contributions and not remitted directly to the EU itself to fund the bloc's activities. It would be worth the cost and likely represent a saving on the costs of mitigating impacts of leaving the EEA and getting to a position where goods can move efficiently from Britain to the continent. Labour leadership candidate, Owen Smith, is either too stupid or too dishonest to be leader. Why? Because of his assertion that there should be another referendum on Brexit because people were misled by leave campaign 'promises' about what would happen if a leave vote was achieved, such as an extra £350m being available for the NHS. It's a ludicrous assertion. The leave campaign highlighted what it believed could be done with savings it said would be achieved by leaving the EU. It was not a promise. It was not part of a manifesto of policies for implementation by Vote Leave after the referendum vote. Vote Leave is not the government and it wasn't standing for election. The Elliott/Cummings cabal was simply setting out what it claimed might be possible (however ridiculous) for the government of the day to do with money it believed could be saved by leaving the EU. Had the remain side won, the result could not be subsequently challenged on the basis that the remain campaign 'promised' there was no plan for an EU army, or that the UK would not pay any additional budgetary contributions to Brussels. As a mere campaign there was nothing they or Vote Leave could say that would bind the government to particular actions. The referendum result is being attacked by any means possible by people who refuse to accept the will of the majority of voters. The reality is Owen Smith knows his assertion is a cynical and calculated piece of deceit. His sheer disdain for a democratically-determined decision and fatuous attempts to apply interpretation to the result in order to undermine it, because he didn't get his own way, is petulance on steroids. In that Smith is no better than Tory peer, Baroness Wheatcroft, another sworn opponent of democracy, who believes voters should know their place, shut up, and leave decision making to vested interests and party machines. Voters should remind these people who are the masters and who are supposed to be the servants. I humbly submit this post as the last in a long while, perhaps even the very last one. It depends on whether I have anything of worth to say in the future. I'm keeping the blog and my Twitter account in place just in case silence gets too much for me. But for now, my mind is to exit the scene content in the knowledge that the all-important vote to leave the European Union has been secured, against all odds. 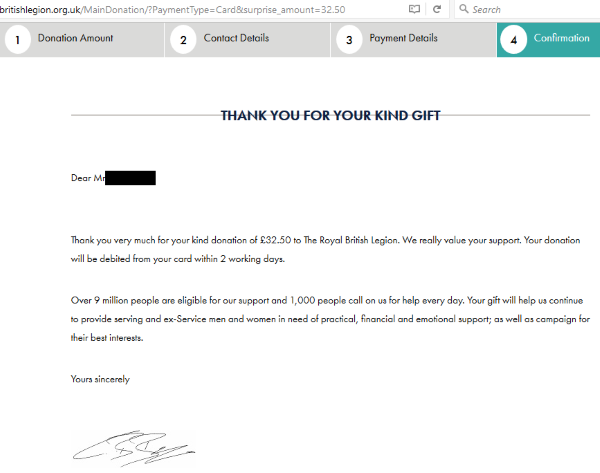 The £22.50 I won plus my £10 stake, has been cashed out from the bookmaking account and donated to the Royal British Legion to support those who have served in our Armed Forces and need assistance, those who have been sent into harm's way by this country and have been injured, and to help families of those servicemen and women who have lost their lives during military action or while training for it. 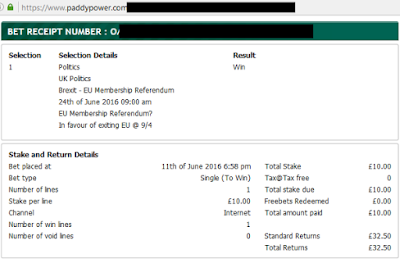 Back to the referendum. More and more people had started to talk about self governance and Britain making its own decisions. Most people laughed off the hysterical predictions of the remain side. They were equally scathing of Vote Leave's ridiculous £350 million savings figure. Interestingly no one was talking about Nigel Farage, and when I mentioned him the responses were uniformly negative. Some did mention their wish to have limits on immigration so only people with jobs to go to could come here. Many who were previously undecided started coming off the fence for Brexit. As the referendum drew near, people had started to think about what it meant and how they should vote. That was their driver. To claim, as many on the remain side do, that people didn't know what they were voting for is simply not true. What really stood out what that the campaigns were not gaining any traction with the people I was talking with. Stronger In and Vote Leave were sideshows, playpens created by politicians for politicians who had to be the centre of attention, despite the whole point of the referendum being that the decision was too big and too important for politicians alone to make. Voters I spoke to up and down the country were making their own minds up about the future direction of this country, and were not being influenced by the point scoring, manoeuvring and oneupmanship of the political classes. Anyway, it is done and dusted. By a clear majority of 1,269.501 votes (equal to 7.8% of the total remain vote), British voters decided that Britain should be run by British people. The decision represented the first steps on the long journey to overhauling democracy in our country so power rests with the people, not the political class. It is time for people to being the process of resuming the position of master and for politicians to get back to being our servants. Inside the EU that would never have been possible. Leaving was an absolute imperative. What happens now is not in the control of the bloggers and commentariat. Instead the Brexit activity is taking on a life of its own, which was always going to happen at some point. The two candidates vying for the Conservative leadership contest have clear and contrasting ideas about how to begin and conduct the Brexit process. I have no skin in that game and really don't care which of them wins. I left the Conservative party after it became clear to me David Cameron was dishonest and unreliable. I see nothing today that makes me want to rejoin the party, or join any other party for that matter. Nothing I say, do or write is going to influence what Theresa May or Andrea Leadsom do next. I would just be repeating the things I've already written on this blog, my campaign blog and on Twitter. It will be down to the eventual winner, her new look cabinet and the civil service to agree a course of action to withdraw Britain from the EU with the best possible and least risky settlement possible. The next Prime Minister, her cabinet and the civil service have a shared duty to get the very best outcome for this country's people. Once we have actually left the EU, the politicians and parties we elect will matter again. That will be the time to take a real interest, because they alone, not the EU, will be responsible for the direction the country takes. That is the time when holding their feet to the fire can really result in meaningful change. That is when the people can begin to wield real power. I hope that common sense prevails and that upon Brexit this country joins EFTA - as most of the world's countries belong to a regional trading bloc - and also secures continued participation in the European Economic Area (EEA), until such time as leaving the EEA can be achieved with the fewest economic consequences. That outcome is not only realistic, but required. EEA participation should only be a stepping stone that enables us to continue trade with EU member states as we do today (well, almost, given the issues with agriculture and fisheries in the EEA agreement). We should only participate in the EEA until we have the unilateral capability and expertise (in trade, international relations, bilateral negotiations, and influential activity on global bodies) to make our own trade agreements and shape global rules and regulations. Only then would we have the strength, required knowledge and ability to continue our journey to full independence. The single market is not and must not be a permanent parking space. A day absolutely must come when we remove the last vestiges of the EU's projected control by dispensing with the last 5,000 or so pieces of legislation that relate to the operation of the single market. But we should not do it immediately. You cannot unpick 43 years of integration in one big bang restructuring without significant pain, and leaving the EEA overnight will be hugely damaging to 40% of export market. We need to work up to it first. But we must do it eventually. There is so much that needs to be done for ordinary people to take power back from the politicians. We need a written constitution. The current unwritten constitution allows the political class to bend it completely out of shape to serve their own interests. We need to close the loopholes. We can draw from our own judiciary people who are suitable to sit and judge constitutional matters within our own Supreme Court. Rights are different from entitlements. Unlike entitlements, rights cannot be conferred on us by the political class, they are ours. But they need to be codified so people understand clearly what they are and can draw upon them as needed to ensure their rights are not infringed. We do not need the European Convention on Human Rights. We are mature and intelligent enough to sift rights from tainted and mischievous entitlements driven by political activism, and enshrine the rights in our own code to be upheld by our own courts. There is something sensible in the concept of having a revising chamber in Parliament. But it is wrong for appointed, rather than elected, people to have the kind of role in the legislative process they currently enjoy in the House of Lords. Appointments to a revising chamber should be of people with knowledge and understanding of real world issues, who can then comment and give advice to the elected chamber about any shortcomings or unintended consequences of legislation. But nothing more. If the House of Commons fails to take heed of the advice, voters can remove MPs accordingly. If there is to be a legislative upper house, similar to a senate with certain non conflicing responsibilities, it must only contain people elected by this country's voters. There are others, such as further limiting the powers of Royal Prerogative, removing Statutory Instruments and making the government seek voter approval the use of taxpayers' money. But addressing the ones above would be a good, if time consuming, start. It may be general politics that sees me return to blogging in the future. But we'll see. In the meantime, thanks for reading my thoughts on my two blogs and my comments on Twitter. I hope you've found some of it interesting. A frustrating feature of the media 'debate' following the vote to leave is the lazy approach to discussing Britain in the context of the single market. The media constantly refers to 'access' to the single market in its coverage. This is causing confusion for many people, which is evidenced by contributors to letters pages and blogs declaring that China and other countries access the single market without having to accept freedom of movement, so why does Britain have to accept freedom of movement. You do not 'access' the single market. You either participate in it as part of the EEA bloc, or you trade with it as a third country. Participants in the single market (EEA) must follow the rules of the bloc, such as freedom of movement of people and capital. Britain is a participant in the EEA at this time and so follows those rules. Third countries such as China simply do trade with the single market, i.e. they buy and sell goods or services from/to countries in the single market. They don't need to follow any rules to do so, they merely comply with regulatory standards. The sooner the media grasps this and conveys it to its audience, the better. After sharing some observations on future negotiations, freedom of movement and trade agreements in my previous post, it's time to turn to what needs to happen next. Media reports in recent days have shown that a long recommended prelimary action to commencing the Brexit journey, namely holding informal withdrawal discussions with individual member states prior to making a formal withdrawal notification to the European Council in keeping with Article 50 of the treaties, has been ruled out by Angela Merkel. 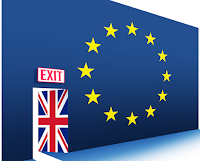 Therefore David Cameron's replacement as Prime Minister, who should be announced on 9th September after the Conservative party leadership election, should issue the formal notification of withdrawal from the EU before the end of September. The only good reason for a delay in the Article 50 notification was to prepare the UK's position and establish a foundation for the formal negotiation. With that off the table, we should be looking to begin the process as soon as possible. Article 50 must not be delayed. It isn't ideal, but given the circumstances it is the approach we need to take. However we need to remain mindful that some of the current people on the EU side who will need to approve any deal between Britain and the EU, may not be in place by October next year thanks to the forthcoming French presidential election and the German federal elections. It may be that any newcomers prove to be more amenable than the current people to the deal that may be negotiated. But there is a risk the opposite may be true and that negotiations might need to revisit some areas previously hammered out. Because of this it would seem Britain has a reasonable case for requesting a unanimous agreement to extend the two-year negotiation period at an early stage, to account for any possible changes to the members of the Council. Both sides stand to benefit from a deal so there would mutual interest in an amicable approach to extending the negotiation period. But to reiterate, Article 50 must not now be delayed. While one third of people who voted to leave said ending freedom of movement was their priority, the national priority is protecting jobs in this country, maintaining existing unrestricted trade and financial services passporting with European Economic Area (EEA) countries and safeguarding our economy. Freedom of movement should not be put before such fundamental matters, rather it can be addressed once Britain has secured continued participation in the EEA. We must not put the cart before the horse. There was far more to EU governance over Britain than just trade. But it remains a hugely important aspect. If we leave the EU without a deal, simply to achieve an end to freedom of movement, the consequences for the economy will be severe and long lasting. By just having a gap period between Brexit and a formal agreement with the EU, exporters will find there is nothing in place that confirms their conformity to regulations. They will also find that usual shipping routes for goods no longer have customs facilities or the staff needed where the EU's inspection of goods can be carried out before passage can continue. There would be many more damaging issues besides, impacting timely delivery of goods and the costs to exporters. As such some things, like freedom of movement, need to wait until we have resolved essential commercial considerations like these. It is why freedom of movement comes in a later stage of the Brexit journey. Resolution won't come immediately, but it will come. We just need to priortise as we unpick 43 years of EU entanglement. It needs to be stated that becoming signatory to the EEA agreement as a non-EU country brings with it unilateral ability to act in the national interest, courtesy of Articles 12-113. It gives Britain the scope to put restrictions on free movement. One EEA signatory, Liechtenstein, has negotiated a defacto end to free movement and instead applies a quota to EU nationals becoming resident in the country. While their circumstances are unique, it demonstrates there is a flexibilty in the application of the agreement that Britain can pursue. The first step to maintaining continued participation in the EEA is to join the European Free Trade Area (EFTA). The only countries that can participate in the EEA are the members of the EU, and the EFTA countries that join on an individual basis. Not only is EFTA the key that opens up the door of possibility of continued EEA participation, but it is one of the largest trade blocs in the world. So the government should be preparing an application to join right away. Iceland will be heading EFTA from next month and will also be taking its turn in the rotating leadership of the EEA too, and they have stated the Icelandic leadership will place a particular emphasis on EFTA relations with the UK. Reports in the Norwegian press from this week's EFTA meeting, say that the Swiss Federal President Johann Niklaus Schneider-Ammann and the Icelandic government are both in favour of inviting Britain to rejoin EFTA (which we left in 1973 to join the EEC). Liechtnestein's position is less clear. There is a bit of concern about upsetting the EU of course. Norway however will need to be won over. Its pro-EU government (at odds with anti-EU Norwegian voters) has been disappointed by Brexit. Norway doesn't currently share Switzerland and Iceland's warmth for the additional strength British inclusion would bring, and it is concerned about the changed dynamic of EFTA in forging future agreements with third countries. Ironically for a government that is keen to join the EU, Norway's concern centres on losing its influence in EFTA if Britain joins! So there is work to do. But that should begin right away. It is important to point out that most WTO member countries are part of a regional trade agreement of some kind, and after Brexit it makes sense that Britain should be too. EFTA would be a very good fit. Accession to EFTA would also make Britain party to EFTA's 25 free trade agreements covering 36 countries unless any of those raise an unlikely objection. Unlike the EU's member states, EFTA members are free to negotiate bilateral trade agreements with any country or bloc they want. This means Britain's rediscovered globalist view and desire to make new agreements without the EU's straitjacket would not be at odds with EFTA membership. What should give serious cause of concern is the Conservative party leadership contest. While most Tory MPs supported David Cameron's remain campaign, most members supported leaving the EU. The runners and riders to replace Cameron include MPs who are hostile to Brexit and MPs who support the very worst outcome for Britain, that of leaving the EEA completely and assuming WTO Most Favoured Nation (MFN) status. As such that doesn't leave much room for people who would promote the common sense vision of retaining EEA participation. The Flexcit plan, and its scaled down version known as The Market Solution, for which an EEA-based option is 'shorthand', is already in the hands of some senior civil servants. But it would make sense for it to also find its way to more senior civil servants across all major departments, along with the the clerks and chairmen of various Parliamentary standing and select committes. By becoming acquainted with the plan and its rationale, and understanding why it bears the least risk to Britain after Brexit, we may be able to help guide senior MPs into make it the roadmap for the post Brexit settlement. Now the electorate has spoken, the government and the civil service have a duty to fight for the best possible settlement for Britain. That, by far and away, is an agreement that maintains EEA participation, as set out in the section above on freedom of movement. Many on the remain side already acknowledge this and have been explaining why in various blogs and newspaper articles. This is very welcome and demonstrates there are cooler heads looking ahead to making our future successful. So that is a summary of the next steps we need to take. If we are to de-risk Brexit and do the best for our country, this is the approach needed. Dr Liam Fox, speaking on the Sunday Politics, said that he would like Britain to exit the EU on 1st January 2019. To achieve Brexit in that timeframe, an Article 50 notification would need be made no later than the end of December this year, and all matters would have to be resolved without the need for an unanimously agreed extension to the negotiation period. This is the equivalent of putting the cart before the horse. Fox is putting the timeframe before the outcome. That is worse than wrongheaded. The most important element of this whole process is not the timing, but Britain getting an agreement with the EU that serves the interests of both, and that the agreement ensures continuity of market participation to protect British jobs, trade and the economy. That should come first, not the timings. So, what of that negotiation? People in the media and on the remain side keep saying the EU won't give Britain a good deal as they will want to punish us, partly for our decision to leave, and partly to dissuade any other EU country trying to follow suit, (Pausing for a second, just what kind of entity is it that tries to preserve its membership by resorting to intimidation and fear? Certainly not a healthy, democratic or benign one). Those people are either unaware of, or ignoring, one extremely important constraint. International law, and the rules of the European Union itself, require that the negotiation with a withdrawing state must be carried out in good faith. This prevents the EU from inflicting retribution on Britain. 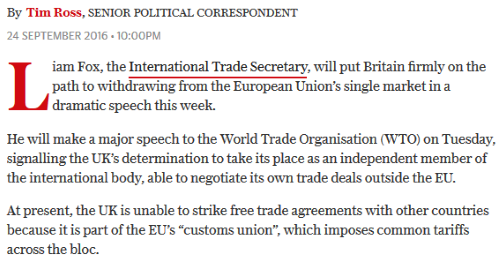 In addition to that the EU, in its own words is "committed to liberalising world trade". After its deal with Japan, the EU restated it is "committed to creating a free, fair and open international trade". Those stated commitments bind the EU to working with Britain to achieve a positive and mutually beneficial deal, such as supporting Britain's continued participation in the single market after joining EFTA. One expectation of many leave voters is that leaving the EU will bring about an end to freedom of movement. Realistically that is not something that can happen immediately. Brexit is a process, not an event. The immediate aim of leaving the EU to regain control over our nation's affairs but preserving jobs and trade by staying part of the single market, is best served by continuing freedom of movement for now. However, many people do not realise that remaining part of the single market after leaving the EU does give Britain the ability to control freedom of movement in a way we cannot inside the EU. This is borne out by the example of Liechtenstein. This tiny country, like Norway and Iceland, is an EFTA member state and participates in the single market as a signatory of the EEA agreement. But Liechtenstein has suspended the full application of freedom of movement and has instead applied a quota system for migrants. This is something that could work well for Britain, giving control over EU migration that we could not otherwise have. Liechtenstein's arrangements were formalised in 1999, and in 2015 it was concluded that there was no need to alter the current rules. That meant the provisions adopted by Liechtenstein on the so-called "sectoral adaptations" could remain unchanged. Having applied these arrangements for 17 years there is no suggestion that it should be discontinued. As a full non-EU contracting party to the terms of the EEA agreement, it follows that what can legally be applied there can apply to any non-EU country participating in the EEA who wish to adopt the same. It's not perfect, but it can be a very effective holding position while Britain starts the much longer task of negotiating a truly comprehensive trade agreement with the EU that would make EEA participation unnecessary longer term. While all this is going on, some on the remain side and in the media claim that we would need to re-negotiate all 40 trade agreements made with other countries by the EU on Britain's behalf while we were a member state. Only that isn't correct. The established principle in international law called presumption of continuity will give Britain the ability to continue trading with those 'third countries' on the same terms as we did before we left. The reunification of Germnay in 1990, the velvet divorce of the Czech Republic and Slovakia in 1993 and the handover of Hong Kong in 1997 all provide precedent to this principle. All Britain needs to do is agree to honour the treaty obligations to which it was party as an EU member state. Britain can follow the example of Slovakia, which sent a letter to the Secretary General of the United Nations stating their intent to remain a party to all treaties signed and ratified by Czechoslovakia, and to ratify those treaties signed but not ratified before dissolution of Czechoslovakia, and that under international law all treaties signed and ratified by Czechoslovakia would remain in force. Added to this, EFTA membership allows a state to have two sets of trade agreements – ones negotiated by the state itself and others negotiated by EFTA as a bloc. By way of an example, Switzerland has a trade agreement with China, but EFTA itself does not. So by joining EFTA we would automatically become party to trade agreements signed by that bloc which would add to the agreements we would already have, giving Britain a greater number of agreements than enjoyed by any EU state. Taken together, following a responsible and phased approach to untangling over 40 years of EU membership does not necessarily entail all the pain and consequences some would have us believe. It's a long road ahead and by navigating it carefully, in the interests of our people and our business sector, we can make the experience positive and rewarding. Welcome to the new blog. We've moved past the campaign and the vote and as attention moves to executing a Brexit from the EU so it is the blog should move with it. The political fallout of Thursday's stunning vote to leave the EU is a long way off settling. While the recriminations, denials and shock continue, we have to start looking at the next steps and their timings. 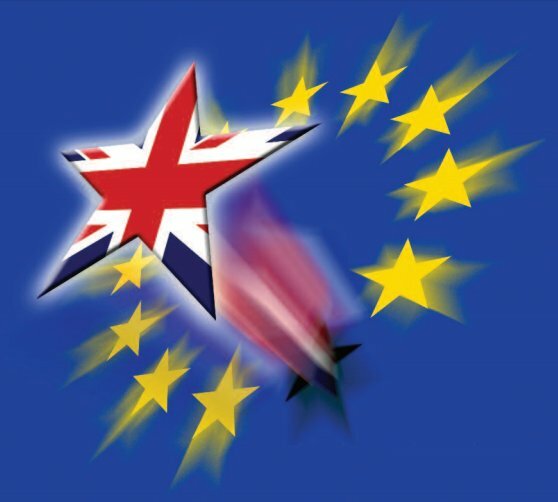 Regardless of claims to the contrary from some political figures, who have been badly misled about what is actually legal and what is in Britain's best interests, there is only one legal and treaty-bound way of beginning the withdrawal process - and that is sending a formal notification to the European Commission that the United Kingdom will be leaving the EU. This is set out in Article 50 of the consolidated treaties. David Cameron claimed that in the event of a vote to leave he would make that notification immediately, triggering a two-year negotiation period with the EU. Thankfully, Cameron decided to resign instead so that someone else could perform the withdrawal duties he was loathe to do. 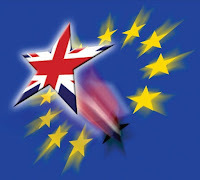 The media has been reporting that European leaders want negotiations over Britain's separation to start immediately. Some have suggested we are obliged to give the notification without delay. But the fact is there is nothing in the treaty that says when the government has to give notification to kick start the two-year period. The decision regarding when to invoke Article 50 rests exclusively with Britain. And there are also some very good reasons not to rush to notification yet. First, the UK is not anywhere close to being ready for the formal negotiation, and before it is triggered, the government and its negotiators need to speak individually to each member state to clarify what we and they want to achieve. Second, next May sees the French presidential election and between August and October the Germans will be electing their new government. If we invoked Article 50 now, we would be starting negotiations with people who may be replaced by others who may pursue a different approach, possibly rendering the first year of talks a waste of time and running down the clock. While we wait for the French and Germans to deal with their elections we should be talking to other member states. It's the opportunity to reassure them about our intention to be a close friend and neighbour and to cooperate in mutual interest, beginning with a continuation of single market participation to the benefit of all parties. We should also be preparing an application to join the European Free Trade Association (EFTA). EFTA member states are able to individually participate in the single market and having left the EU we would need to be in EFTA to be able to maintain market participation. This will be reassuring to businesses, non-EU investors and the financial services industry as it would mean no change to our current economic and commercial dealings. The government should be getting ready for what comes next, both in terms of approach to the impending negotiations with the EU and EFTA, and also the training and readiness of civil servants who will need to upskill rapidly as Britain resumes responsibility for future dealings with other countries and speaking with our own voice on global bodies. That's plenty to be getting along with in the coming months. © Mr Brexit 2016. Simple theme. Powered by Blogger.